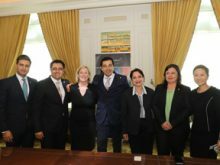 Preferred Hotels & Resorts recently kicked off the Asia Pacific series of its 50th anniversary celebrations at The Leela Palace New Delhi with a specially curated luncheon presentation at Le Cirque, hosted by the group’s CEO Lindsey Ueberroth and Executive Vice President Saurabh Rai. “As we commemorate the Preferred brand’s 50-year legacy of inspiring travel, we are more committed than ever to providing travellers with even more opportunities to embrace the spirit of independence and to making our pineapple logo synonymous with the ultimate hallmark in world-class hospitality,” said Ueberroth. “It is so exciting and humbling to see how far we have come as a company, and I am delighted to have the opportunity to celebrate this major milestone with our associates, partners and friends from around the world. “As the region’s largest independent hotel brand, Preferred Hotels & Resorts is entering its 16th year in India, and we are focused on continuing to build on the foundation of our company’s 50-year legacy of championing the independent hotel space. We are committed to forging ahead with more innovative and strategic consumer-focused initiatives to foster greater engagement in this market,” added Rai.